Today, Alex Gonzalez and prospects were traded for Yunel Escobar. Maybe that doesn’t seem too insane today, but if this news had broke last offseason, nobody would believe that Alex Gonzalez could bring in a player worth 10.1 WAR from 2007-2009 and yet to reach arbitration. Obviously, a large part of this deal is Yunel Escobar’s offensive struggles in 2010, but perhaps an even larger part is Alex Gonzalez’s power surge. Alex Gonzalez has hit 17 home runs in 348 PAs this season, only six fewer than his career high from 2004 (a 599 PA season). He’s on pace to hit 29 this season if he reaches 600 plate appearances. Thanks to that, Gonzalez’s ISO is a career high .238, allowing him to wOBA .341 despite only reaching base at a .296 clip. Jose Bautista is having a similar season. After posting ISOs between .160 and .185 for the last four seasons, his ISO is now up to .306, earning him a position on the AL All-Star team. Bautista’s 24 home runs in only 366 PA is already a career high, as his previous high was 16 (in 469 PA) in 2006. With the Blue Jays swiftly falling out of the race, it wouldn’t be surprising to see Bautista included in a trade down the road. 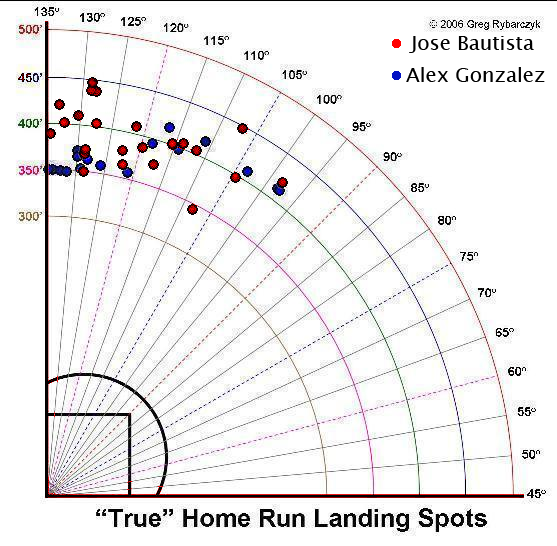 Both Bautista (red) and Gonzalez (blue) are right-handed and extremely pull-happy home run hitters. Bautista’s home runs, overall, tend to go farther, but there is one cluster in particular that both share in common. Gonzalez and Bautista have eight combined home runs in the area between 130 degrees and 125 degrees and less than 375 feet, and Gonzalez has an additional five in the area between 135 and 130 degrees and less than 355 feet. “Just Enough” home run – Means the ball cleared the fence by less than 10 vertical feet, OR that it landed less than one fence height past the fence. These are the ones that barely made it over the fence. Alex Gonzalez is currently the NL Leader in Just Enoughs with ten. Jose Bautista is second with eight. Both have HR/FB rates that eclipse their career averages. Even though the park factor for overall runs in Toronto favors the pitcher, the factor for home runs largely favors hitters. According to StatCorner, the RHB HR park factor in Toronto is 110, heavily favoring the hitters. This is balanced out by a 92 park factor for singles for both hands, which is why we see pitchers seemingly favored at the Rogers Centre. All of the factors for a heavy decline in the second half are there, particularly for Alex Gonzalez, who moves to Turner Field and its 90 park factor for RHB HRs. These players are getting lucky in almost every possible sense with home runs. The Braves are likely to fall victim to a drop in power from Alex Gonzalez, and any team, particularly without a RH-friendly ball park, would likely see the same out of Jose Bautista. We hoped you liked reading Beware the Jays’ Sluggers by Jack Moore! Does this mean that Escobar will start knocking them out with regularity too?